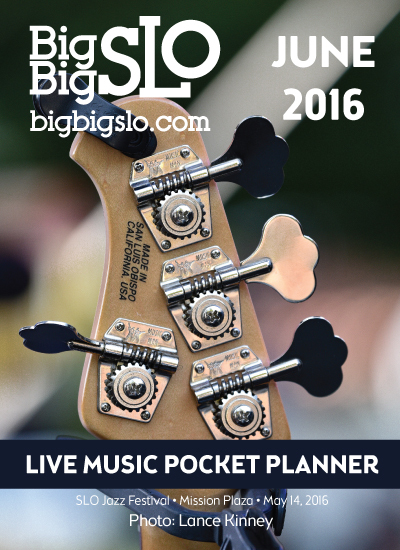 The Pocket Planner — Big, Big SLO! 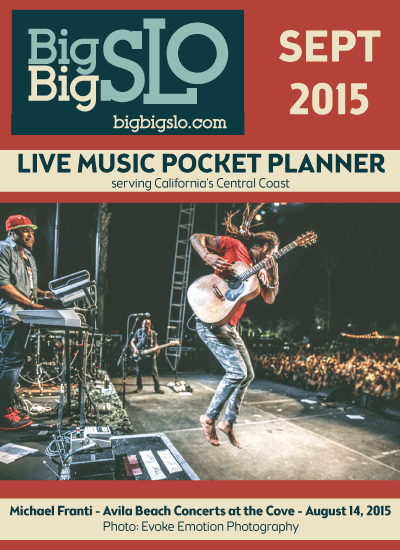 The Pocket Planner: SLO County's premier guide to live music! 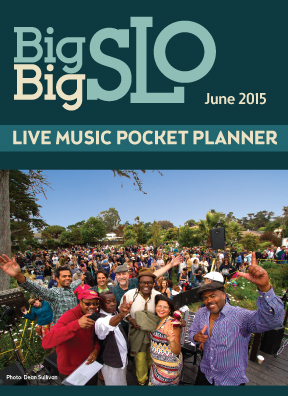 Pocket sized and distributed DIRECTLY into the hands of SLO County's most avid live music consumers! Advertise in the Planner & get more people out to your events! The Pocket Planner is a seasonal publication, and is published monthly from April through October. 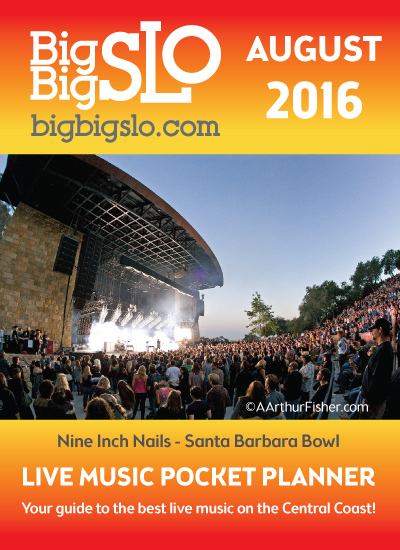 Throughout the other months (November through March), Big Big SLO uses the digital calendar to keep the people in the know. Take a peek at digital copy of the Planner here! Exclusive distribution at the biggest & best venues around: Vina Robles Amphitheatre, Avila Beach Golf Resort, the Fremont Theater, The Siren, SLO Concerts in the Plaza, and many, many more! Paul Irving talking up your events as he attends 50+ events monthly and has hundreds of conversations about upcoming shows! Featured on "Paul's Picks" on 94.9 KPIG's local radio show every Saturday & Sunday morning: Sauce on the Pig with Wesley Price & Moon Powell. 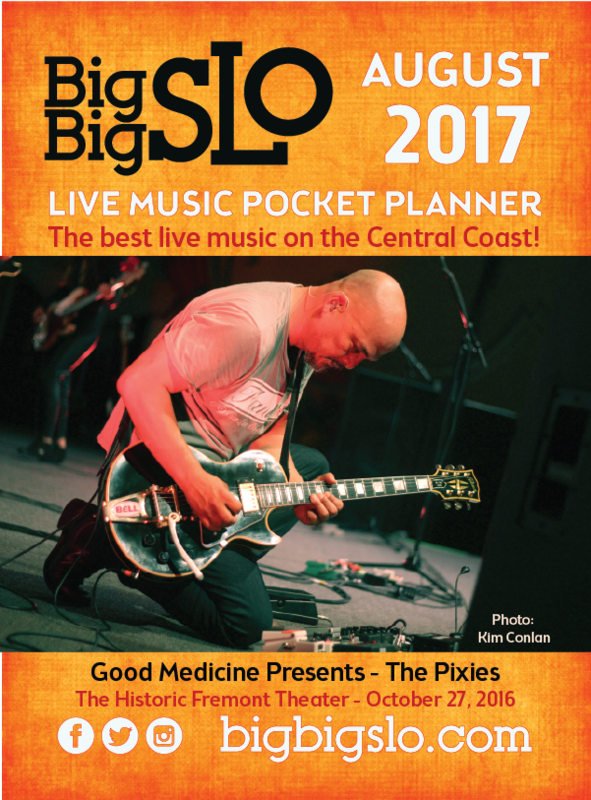 The Big Big SLO Live Music Pocket Planner is a high quality, full color pocket-sized magazine dedicated to promoting live local music events in SLO County. 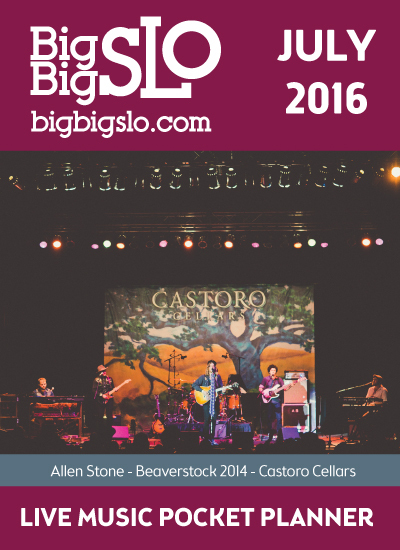 Published monthly, it is delivered directly to music consumers at major music venues. In addition, the planners are distributed to top hotels, visitor centers, chambers of commerce, and select retail locations throughout the county. And they're always available at Boo Boo Records in San Luis Obispo and given to every concert ticket buyer (approx. 800/month). With almost three decades of local music marketing experience, we find that one of the most effective ways to reach music lovers and event goers is right at concerts. Many people enjoy the simplicity of a paper guide as a refreshing alternative to the mass digital messaging we all experience daily. 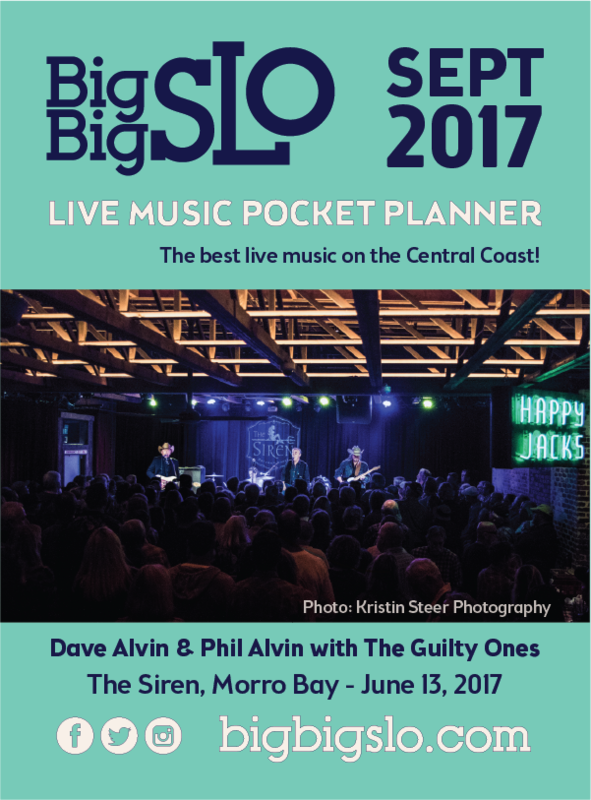 Big Big SLO works with most of the major venues on the coast and has authorized distribution at Vina Robles Amphitheatre, SLO Brew, Good Medicine events, Fremont Theater, Otter Productions events, Avila Beach Golf resort, and many more. This guide is small and portable and will have a high retention rate, living all month on coffee tables, purses, and other places to be referred to over and over. Leverage the Big Big SLO Street Team distribution and get your message out there! The perfect size: 4” wide by 5.5” tall. Slightly smaller than a typical 4 x 6 postcard. How do People get it? Great question! 5,000 of these will be distributed directly in to the hands of music consumers as they exit concerts, festivals, and other music events. 2,000 will be distributed to select hotels and visitor centers around the county. 3,000 will be distributed to select retail locations around the county, including cafes, restaurants, etc. Ads are available by full page, half page, quarter page, or just simply having your events included in the calendar listing section. 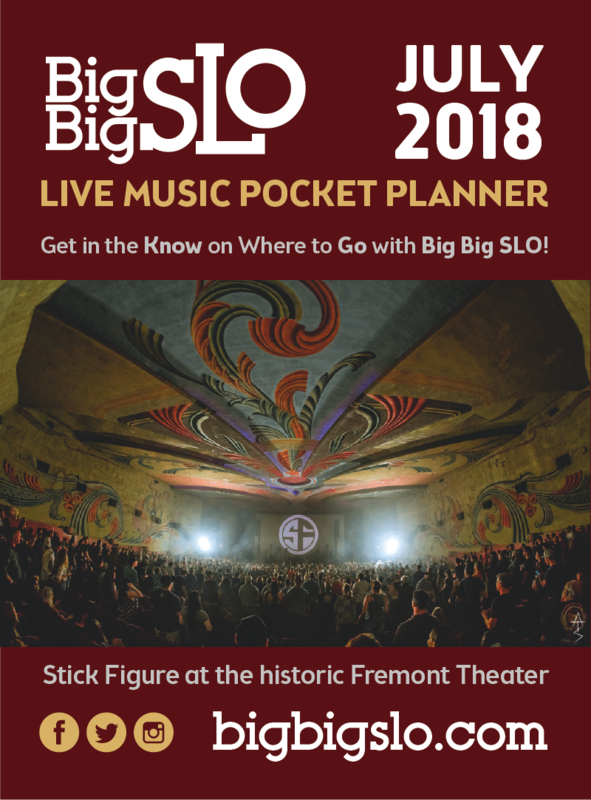 ALL ADVERTISERS RECEIVE COMPLIMENTARY LISTINGS FOR THE SAME MONTH'S EVENTS IN THE LISTINGS SECTION OF THE POCKET PLANNER AND THE BIG BIG SLO ONLINE MUSIC CALENDAR AND THE MOBILE WEB APP! Deadlines for art will be on the 14th of each month. Publication and distribution will start 1 week prior to the 1st of the month, to make sure you have plenty of marketing time for your events. SPACE IS LIMITED, and we are accepting commitments for all future issues now. Full page: 4" wide x 5.5" high. Please include 1/8" bleed on all edges. Half page: 4" wide x 2.75" high. Please include 1/8" bleed on all edges. Quarter page: 4" wide x 1.375" high. Please include 1/8" bleed on all edges. Questions? Please call Paul Irving at (805) 441-3344.